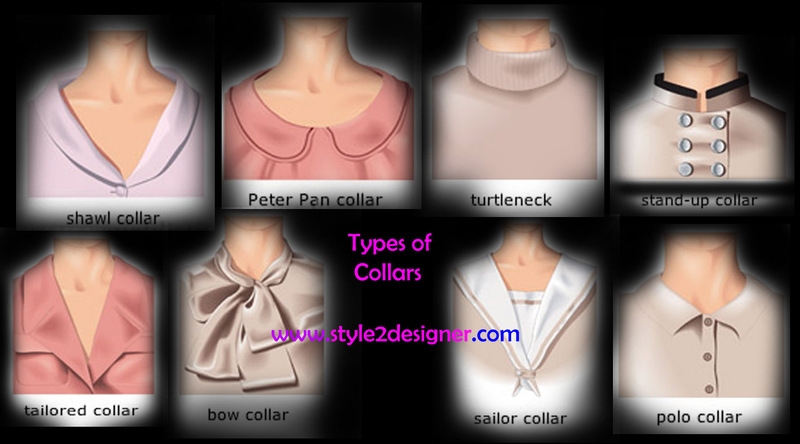 Different Collars: There are some types of collars which were considered as important among many typical elegance neck-bands, below are some of the collars from this group…..
Peter Pan collar: Peter Pan Collars are a flat, round-cornered collar; named after the collar of the costume worn in 1905 by actress Maude Adams in her role as Peter Pan and especially connected with little girls’ dresses. Picadilly collar: It is a wing collar created by means of plastic or celluloid materials. Pierrot collar: Pierrot collar is a round, flat, bendy collar based on the clothing worn by the Commedia dell’Arte character Pierrot. Poet collar: A soft shirt collar frequently with extended points. These were worn by Romantic poets such as Lord Byron and also it was a 1970s style evocative of this. Revere collar: Revere collar is a flat V-shaped collar mostly set up on blouses. Rolled collar: Any collar that is softly turned over where it folds down from the stand (as opposed to a collar with a pushed gather at the fold) is typically called as Rolled Collar. Round collar: Any variable collars with rounded points are considered as Round Collar. Sailor collar: A collar with a low V-neck in front part, no stand and a square back, based on conventional sailor’s uniforms. Shawl collar: Shawl collar has a round V-neckline that is extended to form lapels and moreover used on cardigan sweaters, dinner jackets and women’s blouses. Spread collar or cut away collar: Spread Collar is a shirt collar with a broad spread between the points which can accommodate an immense necktie knot. Tab collar: Tab collar is a typical shirt collar with a small tab that fastens the points together underneath the knot of the necktie. Tunic collar: Tunic Collar is a shirt collar with merely a short standing band around the neck that are 1cm with holes to fasten a detachable collar using shirt studs. Turned-down Collar: Turned down collar is a folded collar pointing down and as opposite to a turned-up collar such as a Wing collar – created by Charvet. Upturned collar: It is otherwise a flat, stick out collar of a shirt, especially a tennis shirt, jacket, or coat that has been curved upward for sport use, warmth and also for a “fashion signal” or a supposed class mark. Vandyke collar: It is a large collar with low points standing high on the neck and hanging onto the shoulders mainly trimmed with lace and worn in the second quarter of the 17th century which can also be seen in portraits by Anthony Van Dyck. Windsor collar: This is a cutaway collar – a dress-shirt collar that is slightly stiff, with an extensive space between the points to provide accommodation a Windsor knot tie which was more popularized in the period of 1930s. Wing whisk Collar: It is a thicken half-circle collar with a big stand and can be worn in the early 17th century. Y-collar: Y-Collar is similar to a Johnny collar which has only one or two buttons at the bottom of the V-neck line, it is creating “Y” shape.